Fukuoka is one of Kyushu's most elegant and vibrant cities. Dazaifu Tenmangu Shrine, Ohori Park, and the exciting Tenjin area are just some of the great places that travelers should visit in Fukuoka. Find out more about what to enjoy in Fukuoka! Fukuoka is the largest prefecture in the Kyushu Region. Its core, Fukuoka City, is known for its wide variety of restaurants with delicious local cuisine. With the airport nearby, it acts as a hub for transportation around Kyushu. From Tokyo, it takes about two hours by plane and five hours by shinkansen (bullet train), to reach Fukuoka. The city boasts many shopping centers and offers various dishes such as tonkotsu (pork bone) ramen, motsu nabe (chitterlings hot pot), mentaiko (cod roe with red pepper) and mizutaki (chicken and vegetable stew). 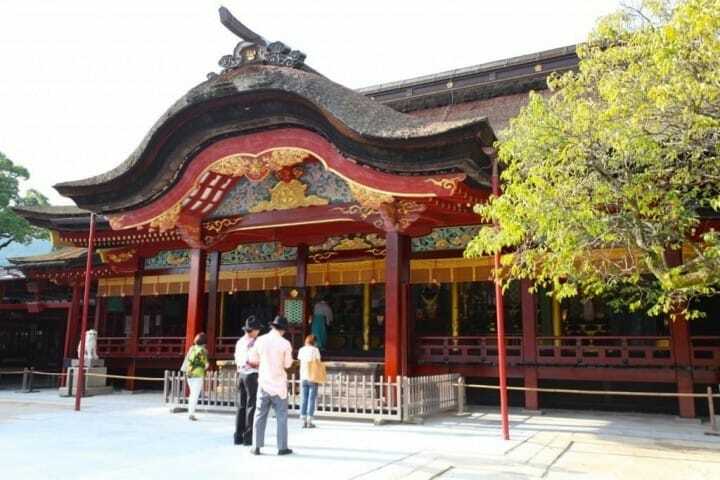 There are six main sightseeing areas in Fukuoka. 1. The Hakata Station Area: A mixed area with modern office buildings and streets with a traditional atmosphere. 2. The Tenjin Area: The largest shopping area in Kyushu. 3. The Nakasu Area: An entertainment district, where the yatai (open-air food stalls) come out at night. 4. Ohori Park: A recreational place for the citizens, where visitors can also appreciate history and art. The park is two subway stations away (a four-minute train ride) from the Tenjin area. 5. Seaside Momochi: Fukuoka Tower and Fukuoka City Museum, two institutions symbolizing Fukuoka, are located in this area. It takes 15 minutes by bus from the Tenjin area to Seaside Momochi. 6. Dazaifu: Dazaifu Tenmangu Shrine, which is dedicated to the God of Learning, and the Kyushu National Musuem are both located here. From the Nishitetsu Tenjin Station, it takes 35 minutes by train to Dazaifu. The climate is relatively mild, but the average temperature in summer is about 30 degrees Celsius, and sometimes rises over 35 degrees. The temperature remains high even in September, so visitors should dress accordingly. By contrast, the temperature plummets in winter. The transportation system in Fukuoka City is top class, so moving around by bus or subway is recommended. For instance, the Nishitetsu Bus offers circular-route bus services for 100 yen. The Nishitetsu Train, Fukuoka City Subway and the JR lines are also available. For further information, please check the article below. Let us introduce to you ten recommended sightseeing destinations in Fukuoka. Many people come to Dazaifu Tenmangu, to pray for good grades and success in entrance examinations. Sugawara no Michizane, also known as the God of Learning, is enshrined at the Tenmangu. There are various shops along the way to the shrine, where you can buy the local specialty, umegaemochi (a bean-jam cake). In the spring, the ume (plum tree) blossoms, which Dazaifu Tenmangu is famous for, and the gorgeous cherry blossoms welcome the visitors. When asked about Fukuoka, many people think of the yatai (open-air food stalls). Over 200 yatai come out in areas such as Tenjin, Nakasu and Nagahama, which frequented by the local workers after a day at the office. The yatai have a casual atmosphere, and the customers can watch their ramen and yakitori being cooked over the counter, while getting friendly with the people sitting next to them. This is the largest shopping area in Kyushu, where a long-established department store and contemporary shopping buildings stand side by side. There is also an underground shopping mall, which is 590-meters long. Buildings of the modern Japanese era, such as the former Fukuoka-ken Kokaido Kihinkan (public hall) and Fukuoka-shi Aka Renga Bunkakan (Red Brick Building), are also located in this area. People come here to enjoy shops, restaurants and movie theaters. Various events are scheduled daily at the Sun Plaza Stage, located at the center of the building. Concerts and recording sessions of television programs are also scheduled there during the weekends. Ohori Park is a recreational space for the citizens of Fukuoka, providing them with a Japanese garden, a Noh Theater and a boathouse. People taking their dogs for a walk and joggers can be seen around the large pond in the park. Shikanoshima, an island located in Hakata Bay, can be reached easily by car or bus from Fukuoka. There are historic shrines and stone monuments here, as the island played a big role in Japanese history. It takes about 15 minutes to drive around the island, so visitors can also enjoy the bay view. Nokonoshima Island Park is located on Nokonoshima Island. From Fukuoka, it takes ten minutes by ferry to the island, and a large number of visitors come to the park to enjoy the seasonal flowers. Besides the park, Omohide-Dori, a street to enjoy the retro scenery, and the petting zoo, where children can have lots of fun, are also popular. Fukuoka Tower is an urban landmark. The whole city and the bay can be seen from its observatory, and the night view from the height of 123 meters is breathtaking. The tower is also illuminated in the winter season, drawing a large crowd. Enjoy A View Of Fukuoka's Gorgeous Scenery From Fukuoka Tower! There are restaurants and marine sports shops in this park. It is divided into two districts: the Momochihama district, where visitors can enjoy the beach, and the Jigyohama district, where various events take place. Fukuoka Tower, Fukuoka City Museum and Fukuoka Yahuoku! Dome are located nearby. This building contains a hotel, a shopping mall, restaurants, a theater, and an art museum. Various performing arts such as Kabuki and musical shows can be appreciated at the Hakataza theater. The Riverain has a conservative atmosphere and is ideal for visits with the whole family. The building is located above the Nakasu Kawabata Subway Station, so it can be accessed easily. Fukuoka has more to offer than just the ten areas mentioned above. Prominent cities such as Kitakyushu and Kokura are also located nearby. If you have the chance, use this article as a guide and explore the areas in and around Fukuoka city.